KANSAS CITY, Mo. 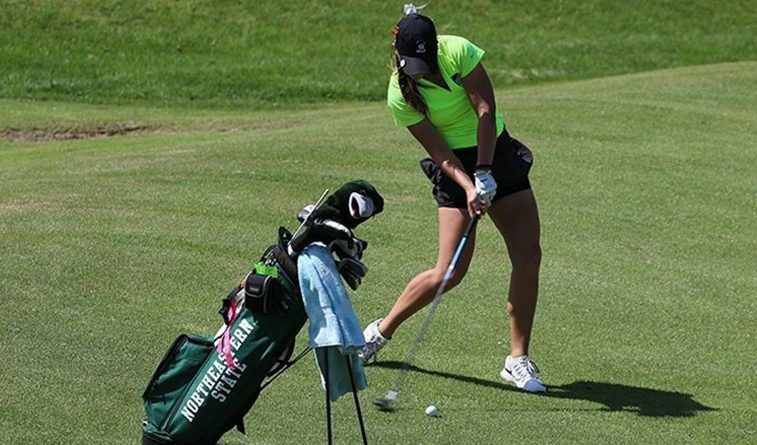 – Northeastern State opened a 19-shot lead over the University of Central Oklahoma through two rounds of the 54-hole MIAA Women’s Golf Tournament title. The RiverHawks got a pair of 5-over-par 77s from Baylee Price and Halie Wright for a second-round team score of 314 at Swope Memorial Golf Course. After opening the tournament with a wind-blown 324, NSU shaved ten shots off its team score on Tuesday. Tuesday’s calmer conditions certainly affected almost every school’s tally. Missouri Western, Lindenwood and Central Missouri round out the top five teams. Wright, the No. 5 bag, was first in the clubhouse with a 77. Beginning on hole ten to start her round, Wright made the turn at 4-over, then played the back nine just 1-over with six pars, two bogeys and one birdie. Price accomplished the same feat as well to help NSU pad its lead. Lexi Armon also posted a 79, while Kelsey Lumpkin and Ebba Moberg shot 81 and 82, respectively. All five Riverhawks are in the Top 10 with 18 holes remaining. In the medalist race, Central Oklahoma’s Sydney Roberts (154) leads Lindenwood’s Dakota Limkemann by 2 shots. Price moved from sixth to third at 158. Roberts shot a 76 to take over the individual lead and put Central Oklahoma second in the team race. The Bronchos of head coach Michael Bond shot a 324 and have a 654 total after two trips around the 5,893-yard, par-72 Swope Memorial Golf Course. Final-round play begins at 8:30 a.m. Wednesday, with the tournament champion earning an automatic berth into the NCAA Division II national tournament. Roberts was the only UCO player to break 80 in the second round. Makena Mucciaccio and Anna Pool both shot 82, while Marla Sounvannasing had an 84 and J.T. Neuzil a 91. The Bronchos started second-round play on the back nine and Roberts made one birdie in shooting a one-over 37. The freshman sensation had two back-nine birdies and was two-over for the day before double bogeying her final hole. Roberts has a 154 total and owns a two-shot lead over Lindenwood’s Dakota Limkemann. Pool got off to an incredible start, shooting an even-par 36 on her front nine with seven pars, one birdie and one bogey. But she ran into trouble on the closing nine, coming back with a 46 for the 82. Mucciaccio had steady nines of 41-41 in her 82, while Souvannasing had a 45 on the front before recovering with a back-nine 39. She’s tied for sixth in the medalist race with a 161 total.